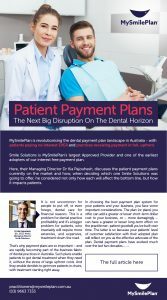 MySmilePlan is revolutionising the dental payment plan landscape in Australia – with patients paying no interest EVER and practices receiving payment in full, upfront. Smile Solutions is on of MySmilePlan’s largest Approved Providers and one of the earliest adopters of our interest free payment plan. Here, their managing Director Dr Kia Pajouhesh, discusses the patient payment plans currently on the market and how, when deciding which one Smile Solutions was going to offer, her considered not only how each will affect the bottom line, but how it impacts patients. It is not uncommon for people to put off, or even forego, dental care for financial reasons. This is a problem for dental practice profitability and it’s a bigger problem for patients, who invariably will require more extensive, and expensive, treatment down the road. That’s why payment plans are so important – and are rapidly becoming part of the business fabric of dental practices in Australia. Such plans enable patients to get dental treatment when they need it, without the stress of large upfront costs. And they enable dentists to get more patients in chairs, with treatment starting right away. In choosing the best payment plan system for your patients and your business, you face some important considerations. The plan (or plans) you offer can add a greater or lesser short-term dollar cost to your business, or – more damagingly – can have a greater or lesser long-term effect on the practitioner–patient goodwill you’ve built over time. The latter is so because your patients’ level of customer satisfaction with their adopted plan will reflect on you as the effective advocate of the plan. Dental payment plans have evolved much over the last two decades. The three main versions are summarised here. These plans – in reality personal loans – have been around for over three decades, and in my opinion they haven’t benefited anyone except the financiers. It never ceases to amaze me how dentists are willing to offer their patients payment plans charging between 12% and 18% per annum in interest. Let’s get real: if the patient can’t afford to pay the bill, how are they going to afford, on top of their monthly repayments, double-digit interest rates that often default into exorbitant penalty compounding interest rates after the agreed term? Generally, these plans have been scorned by discerning patients, who usually afford their dental treatment by either drawing down against their mortgage, finding more competitive personal loans with relative ease, or attempting to save up in advance. I’ll say no more about these plans because, with the no-interest payment plan disruption that is coming, they will soon be a relic of our “irresponsible lending” history. This type of payment plan became prominent around a decade ago. If you are sitting on a pile of cash in your business trading account, then payment plan v2 is the one for you. These plans usually charge the practitioner the lowest percentage rate on the market: a figure of between 3% and 4% of the total treatment plan fee, less for practitioners with historically lower levels of bad debt (e.g. orthodontists). This no-interest (to the patient) payment plan method pays the practitioner for treatment carried out in equal monthly instalments. The group that initially embraced such a methodology were the specialist orthodontists, who usually aligned their protracted treatment times with the length of the drip feed payment plan. As many were already offering internal payment plans and giving their front desk and management staff much to worry about, outsourcing this task was a highly attractive option. Its primary appeal is the patient no-interest component. You, the practitioner, wear the upfront costs of providing the treatment, including lab fees in many cases, and then you receive small instalments over 12 to 24 months (according to the plan length agreed upon). Cashflow, you’re thinking! Take a general dental practice that enjoys a 30% profit margin – actually quite good by today’s standards. If you choose to put only 1 out of every 10 dental treatment plans through a drip feed payment plan system with protracted payments, then you’re immediate cashflow drops by 10% and, since your overheads remain intact, your immediate profitability also drops from 30% to 20%. In other words, your profit is reduced by one-third. Most dentists I know can’t afford a 33% pay cut, and therefore very few practitioners are inclined to overtly promote this type of payment plan, traditionally choosing to keep this option as a last resort for patients who would otherwise walk. Make no mistake: money that’s due up to two years from now is money that you must somehow cover until it arrives, and you will feel this hit. Now, you’ll eventually reach cash flow equilibrium in a couple of years’ time, as long as the dollar value of your total plans stays constant, since growth in payment plan numbers or average amount will mean an ongoing cashflow hole. Month-to-month turnover fluctuations are also very challenging. High-revenue months such as November and December, with more patients going on plans, are followed by a pile of big bills in January and February. But guess what! There’s less cash in the bank than you anticipated. With the figures provided above, if your practice were to embrace and promote a protracted payment system, to the point where 3 out of every 10 dental treatment plans were using the system, this would obliterate your available profit completely and force you either to trade with borrowed money or to cease trading until cashflow improved. Finally, the drip feed payment plan financiers usually offer guarantees for slow payers and bad debtors. But I strongly recommend that you make yourself aware of the applicable exclusions in the fine print… it might just surprise you to realise how broad these can be. More recently we have seen an evolutionary adaptation of plans where the money is deposited into the practitioner’s account up front and in full on commencement of treatment (minus a percentage that’s deducted from the total treatment plan). The greatest attraction of these plans is the cashflow benefit to the business; hence they will undoubtedly procure the lion’s share of the burgeoning total payment plan market in Australia in the years to come. With no cash flow hindrance, what we will see is more aggressive marketing of such plans by practices that can now afford to offer them to all of their prospective patients. That’s because the fee for practitioners (say, up to 10% of the treatment cost), which may be offset with an initial overarching practice fee increase, will do little to dent the overall profitability of the business. Taking into account that the practice’s New Patient numbers will invariably increase with such marketing, and treatment plan conversion rates will also substantially increase in response to the offers of “treatment now, pay later”, the likelihood of increased profitability for the business is quite real. I anticipate that spruiking of payment plans v3 will soon become prominent on the home pages of Australian dental websites, with catalogues on reception desks and payment options on offer to all patients in Australia. The reality is, most dentists I know will offer a 10% discount to patients willing to pay upfront because of the cashflow benefits of upfront payment! So let’s sit back and watch this disruption piece unfold. But wait! Not all v3 plans are the same. What variations are there? Upfront payment may be in full on acceptance and approval of the plan application, or in tranches as the work is carried out and completed – obviously the former making better cash flow sense. Guarantees of payment are not necessary for the former but are certainly a consideration with the latter. Annual or monthly subscription fees regardless of usage levels, or per plan administration fees, can be an enormous disincentive for the practitioner. Some plans may charge subscription fees in the order of $200 per month, similar to a gym membership. If you are anticipating approximately $10,000 of payment plans per month, an onerous subscription fee in the order of $200 per month equates to 2% additional “effective interest” on-charged to you for each and every case. Worse still, the $200 is still applicable while you holiday over summer. Patient establishment fees, monthly processing fees, monthly account keeping fees and other hidden fees can vary greatly between v3 plans. It may seem inconsequential at first, but your patients will scrutinise these fees carefully in assessing the overall bottom-line cost to them, as well as when comparing different offers from competitors. In a $2000 case on a 12-month payment plan, a variation of only $40 in the establishment fee and monthly account keeping fees of $3-$4 is equal to 4% additional “effective interest” on-charged to the patient by stealth. You can therefore see, with the above points 3 and 4, that a combination of a simple monthly subscription fee to you plus a higher fees to your patient can add 6% in additional “effective interest” charges for the plan financier, to the material detriment of your practice and/or your patient. In such circumstances, the headline quoted percentage fee for the plan is rendered somewhat misleading. This leads me to the high-interest v3 plan – the “goodwill” challenge. Now, when I mention high interest, you will probably picture the percentage “you” are being asked to pay, which is certainly one consideration. However, with many v3 plans the devil lies in the patient default interest rate charges. You’re probably wondering, how is that? – the patient is on a no-interest payment plan. Well, as we all know by now, “someone pays”. Some payment plans function within the non-credit sector of the lending industry where their licences prohibit them from charging default interest rates. As a rule, these plans tend to offer longer periods for repayment and they ensure that each monthly repayment is made through more diligent arrears follow-up. They tend to charge higher up-front interest rates to the practice, which is necessary for their arrears and potential bad debt exposure, as they never charge default interest to the patient. Other payment plans function within the credit sector of the lending industry, much akin to credit cards, where their credit licenses allow them to charge default interest rates. As a rule, these plans can offer payment lengths as short as 3 to 6 months and they require that the patient make minimum payments each month. They can offer super-sharp interest rates to the practice that can make your home mortgage look expensive, since much of their revenue comes from high default interest rates charged to the patient, usually in the order of 15% to 20%, if a residual balance remains on the account once the term of the policy is up. Sometimes, they backdate the interest to the start of the loan, and sometimes the interest starts to accrue even when the requested minimum monthly payment is made, since it is deemed short of the pre-agreed full monthly payment figure. While it may, at first sight, seem appealing to choose a payment plan with a lower interest to your business, we have to remember that we are not buying flat-screen televisions or lounge-room furniture. The ongoing intimate nature of the dentist–patient relationship, and the emphasis we place on goodwill within our patient base, dictates that high interest penalty default rates will end up creating “badwill” for you and your practice and this may have financial repercussions far greater than the initial savings on interest fees for the practice. Secondly, shorter repayment periods of 12 months or less, although appealing for the business by way of lower upfront costs, are actually akin to irresponsible lending since most patients taking up payment plans will need the longer repayment periods to afford their monthly repayments. A patient who finalises their repayments is a happy one. They will not blame you for introducing them to a black hole of unjustifiably high compounding interest and they will also be better positioned to undergo further rounds of treatment having benefited from a genuine no-interest facility. Having an understanding of what patients are looking for in a payment plan can be helpful to practitioners when choosing a plan. There’s little point in choosing a plan that doesn’t work for your patients as they may go to another practice offering more appropriate payment terms or just avoid dental treatment entirely. It’s also important for us practitioners to be aware of what constitutes responsible lending and not set our patients up on a plan they can’t afford, with dire financial consequences even though minimum monthly payments have been adhered to. Finally, no two dental payment plans are the same. From the establishment and subscription fees, the time frame of the payment plan and the default interest rates to when the dentist receives payment, payment plans will vary. It is incumbent on dental practitioners to research the available plans carefully to ensure that we offer the most suitable plans – reflecting not only our own business ethics and standards but also, equally importantly, our patients’ needs.